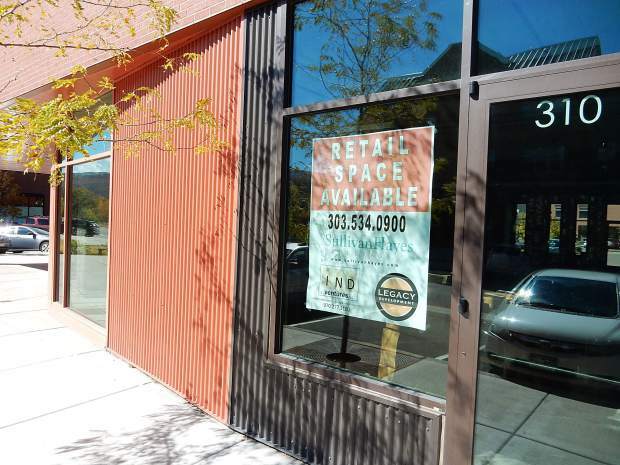 A sign advertises unrented space at Willits Town Center in Basalt. A glut of unleased commercial space spurred the developer of Willits Town Center to ask Basalt for approval to adjust its plans. The developer of Willits Town Center sweetened a deal to seal approval from the Basalt Town Council to convert commercial space into residences. The developer, Mariner Real Estate Management, agreed to build two additional affordable housing units and contribute them to the town’s inventory. The units will be two bedrooms, 1½ bathrooms each and be rented to people who qualify through the town’s affordable housing guidelines. Mariner will also convey seven parking spaces for vehicles and two for motorcycles to the town. The spaces are in an existing underground parking garage. The developer will also provide three on-street public electric vehicle charging stations as part of future development. It will also study safety improvements to a key intersection at Harris Street and East Valley Drive in the heart of the center and spend up to $20,000 on recommendation enhancements. The town council asked the Willits developer at a meeting in January to provide more public benefits to make up for the loss of commercial space, which would produce revenues for the town. “Overall, we’ve reached a pretty good happy median,” said Councilman Bernie Grauer. The sweeteners come on top of public benefits Mariner already committed to fulfill. Those include handing over an existing commercial space of nearly 1,950 square feet to the town for use for government or nonprofit services, turning over the keys to a three-bedroom affordable housing unit to the town and voluntarily agreeing to a real estate transfer assessment. The assessment on certain, future real estate sales will raise an estimated $1 million for improvement projects, affordable housing, parks or assistance to nonprofit organizations at and around Willits. All told, the public is receiving about $2.8 million in public benefits, according to the town’s planning department. The two new affordable housing units will cost an estimated $510,000 to construct. In return, the Basalt Town Council unanimously approved allowing Mariner to build up to 74 additional free market residences at the project. Those units can total up to 58,000 square feet of additional residential space. Adding 58,000 square feet of residential space will reduce the commercial space by an even greater amount, according to Susan Philp, town planner. Willits was once approved for a total of 563,717 square feet of commercial and free-market residential space. The developer previously agreed to reduce that amount by 27,283 square feet, she said. Now, the commercial space could be reduced by another 58,000 square feet. Mariner’s local representative, Tim Belinski, said the approval to convert approved but unconstructed commercial to residences is vital to getting the project completed. Willits Town Center was approved in 2001, but construction took a while to get underway, then stalled during the recession of 2008. The first developer, Joseph Freed and Associates, lost the property in foreclosure. Mariner resurrected the project, first completing the Whole Foods building. Belinski has said in repeated meetings with the council that the demand doesn’t exist to build all the commercial space approved due to the changing nature of bricks-and-mortar retailing. Online sales have eaten into demand for physical retail space. “I hope you’ve heard from us, Willits is at a tipping point, it really is,” Belinski told the council Tuesday night. It is imperative that the project gets completed before other projects come online, he said. That was a thinly veiled reference to the Tree Farm project, approved across Highway 82 by Eagle County. The Tree Farm will add up to 340 residents and 135,000 square feet of commercial space. Mariner has been trying to negotiate conversion of commercial to residential space for several months through at least six council meetings. Councilman Auden Schendler complimented Belinski’s “model behavior” as an applicant during that lengthy review. “You know, you could have gotten annoyed over this long process,” he said.